Acrylic Resurfacer with Sand is a 100% acrylic latex emulsion designed for onsite mixing with water. .11 to .13 gallons per square yard. 100% acrylic latex emulsion designed for onsite mixing with water. 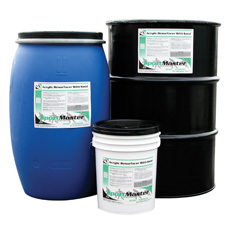 SportMaster Acrylic Resurfacer with Sand is a 100% acrylic emulsion with sand designed for filling and smoothing asphalt or concrete surfaces in preparation for SportMaster color coating systems. Pavement surface must be cleaned entirely of dust, dirt, debris and all loose materials. New asphalt must cure 14 to 28 days before application. Repair of pavement surface defects, depressions and cracks must be completed prior to application. All repairs must be flush and smooth to adjoining surfaces. Cement – 1 Gallon (always mix cement thoroughly with a small amount of water before adding to patch mix. For applying patch mix, you’ll need a straight edge or screed bar (Metal, wooden, aluminum, etc.) that is wider than the depression area that will be patched. Apply large amount of patch material at one end of the depression and use the straight edge to screed and smooth material across the depression. Feather the edges of the patch material with a hand trowel or squeegee to assure a smooth patch. Allow patch to cure 24 hours. If shrinkage cracks occur when patch dries, simply apply another coat of patch mix with a squeegee. This will fill in and eliminate shrinkage cracks. Once patch mix has thoroughly cured (at least 24 hours) sanding or grinding may be required to provide a smooth patch finish. Apply Acrylic Resurfacer With Sand as a coating using a soft rubber squeegee. Allow to dry. Scrape all rough spots and ridges before applying the next coat. Apply one or two coats, depending on surface porosity and condition. Two coats are recommended on new or uncoated asphalt. Apply mixed Acrylic Resurfacer with Sand with a soft rubber squeegee. Scrape all rough spots and ridges before applying successive coats. Allow Acrylic Resurfacer with Sand to dry completely before applying additional coats. 30 to 60 minutes under optimum drying conditions. View in Catalog 5 gal. Keg 73 lbs. 30 gal. Drum 435 lbs. 55 gal. Drum 785 lbs.